Experience dazzling massage to go! The Charmed Petite Wand is perfect for stimulating all your sensitive areas and looks fabulous doing it! 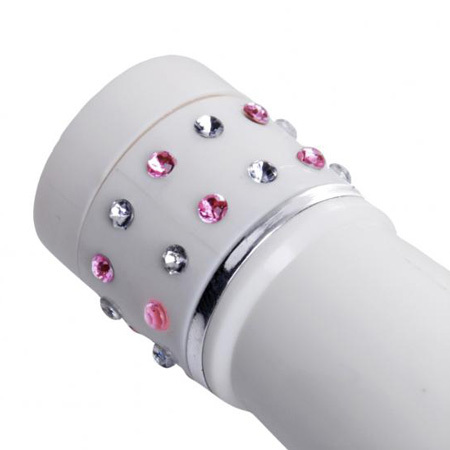 This petite wand is powered by an ultra strong variable speed motor and is accented with beautiful pink and white gems. 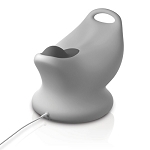 The ergonomic design of Charmed and the sleek finish add to the exquisite nature of this magnificent mini massager. Perfect for fun on the go! Measurements: 4 inches in length, 1 inch in diameter. Material: ABS plastic and TPR. Color: White. Note: Requires (6) tab batteries, included.